Perseverance, achieving new goals and her commitment to the Chinese community living in Spain are the hallmarks of Margaret Chen’s successful professional career. She is currently Asia Manager for Telefónica and a member of EADA’s International Advisory Board. 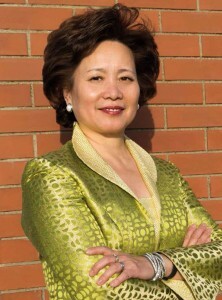 Loyal to her culture, Chen defends open discussion, personal relationships and trust, values that need to be strongly promoted now more than ever. This platform, which is supported by EADA’s Entrepreneurship Centre, has been created as an ecosystem where entrepreneurs, investors, academics and experts can converge and follow-up on the process for creating a company. Q: ‘Miracle’ and ‘Chinese challenge’ are the most common headlines in the international press about China’s transformation. Would you use these same terms? A: I also think that China’s spectacular economic growth over the last 30 years (at rate of 9% annually) has been a miracle. Although this percentage has currently gone down to 7%, we cannot call this economic deceleration, as some analysts have noted. The Chinese economy continues to grow at an optimal rate. Q: One of the main criticisms about the Chinese economic model by the West is excessive government control. Do you see this as a problem? A: It is true that there is strong state intervention in the country’s key sectors, although it is also true that this control is becoming lighter and that China is evolving towards a market economy. In any case, this government centrality has been key to China becoming the world’s leading economy. For example, the government exerts a certain power over companies for the wealth they generate to stay within the country and to encourage internal consumption. This centrality has also made it possible to speed up the construction of a great number of roadways, ports, airports, rail networks and telecommunication networks. Q: Has China ceased to be the factory of the world? A: China has gone from ‘made in China’ to ‘invented in China’. In this way, China managed to overcome the prejudice that had dragged it down for years, a prejudice associated with cheap labour and low quality products. Nowadays, on the other hand, China is associated with innovation, scientific research and the entrepreneurial spirit. It also has higher labour costs, given that salaries have doubled over the last few years. In China, if you have a good business idea, you can benefit from public incentives. Hence, the success in recent years of technology and science parks where a large number of foreign capital joint ventures are concentrated. In addition, new start-ups do not aspire to copy existing models, but rather to create patents. Q: Aside from innovation, what other factors have led China to become the leading world economy? A: One of the most important factors is its population. China is the most populated nation in the world today. Any innovation or product has a greater impact than in a smaller country. To this, we must add the increase in qualified workers. For example, every year there are two million new engineering graduates. This is where the success of companies like Huawei lies: it has 15,000 people developing innovative solutions and in the digital communications sector it leads the patent request ranking — in 2015, it presented a total of 1,197 patent registrations. Many Chinese people dream of working in cutting-edge companies like Huawei, Alibaba, Lenovo, Tencent, Baidu, Haier or Xiaomi, where in many cases they can become shareholders. Q: What is the international impact of the technological revolution China is living? A: I would highlight its capacity to generate standards that can be exported to other countries. In the IT sector, we have several examples, such as the popular app MyIdol, which allows us to scan our face and create a virtual avatar, or WeChat, a Tencent app that has reached 549 million users in over 200 countries in its first quarter. We cannot ignore Alibaba’s foray into the profitable market of virtual reality, which has sparked the interest of important technological companies across the globe. The same goes for the latest developments in biomedicine, given that Chinese researchers have been the first to use gene editing to modify human embryos at an in-vitro fertility clinic. Q: What role will China play in the powerful Asia-Pacific axis? A: China is leading this axis, which will be at the new world economic and financial centre. Proof of this is the 21st Century Silk Road, what has been called One Belt, One Road, an ambitious project to connect China with the rest of Asia, Europe and Africa by means of land-based routes (railways, airports, roads and financial networks) and maritime routes (new ports and commercial maritime relations). It is a strategy of the Chinese government to establish new international alliances and promote trading, financial and communication links. In order to develop this initiative, China has created The Asian Infrastructure Investment Bank, which already has over 60 countries adhering worldwide –among them Spain and United Kingdom–, and which has approved an investment fund specifically for the Silk Road. Q: As a member of EADA’s International Advisory Board, how are you living the opening up of the business school to the Chinese market? A: Well, with lots of enthusiasm and high expectations. With Jordi Díaz, Director of Programmes at EADA, we have entered several agreements with prestigious Chinese universities, such as Shanghai International Studies University (SISU), the School of Economics and Management Tongji University and the International Business School Suzhou (IBBS), which is part of Xi’an Jiatong University of China and the University of Liverpool (XJTLU). We have reached several collaborative agreements that include student and staff exchanges, joint academic research projects, networking and internships. Q: What kinds of opportunities does this increasingly close relationship with such prestigious Chinese universities represent for EADA? A: Opening up EADA to the Chinese market responds to the increasing interest of Chinese executives and senior managers in developing international business ventures, establishing bilateral relations with other European countries and making use of the new opportunities offered by South American markets. In this sense, EADA’s academic programmes, which are very business-focused, fit the demands of this type of profile perfectly. Morevoer, EADA is very well-positioned in the international rankings, something that is highly valued in China. Hi. thanks for this interview.she has an excellent point of view. Great post. thanks for sharing this content.